The International Guitar Festival (7 - 13 July 2019) - Festival with master-classes of interpretation and concerts by world-class guitarists. Festival Of The Three Neighbors (9 - 10 August 2019) - Meeting of folklore ensembles. Kampanila (29 August - 1 September 2019) - International Choir Festival. Pilgrimage to Holy Hill (1 September 2019) - Traditional pilgrimage to the Black Loretan Madonna on Holy Hill in Mikulov. Palava Wine Harvest Festival (6 - 8 September 2019)-a grand event with a historical fair and wine market, historical and folk costume parades, wine tasting, a program of events for all ages and local culinary specialties. Valtice Wine Fair (10 - 11 May 2019) - Prestigious wine exhibition. Znojmo Wine Festival (13-15 September 2019) - One of the biggest wine harvest festivals in the Czech Republic. Try Burcak, young wine only weeks old. Holidays in Telc (26 July- 11 August 2019) - Folk festival, theatre, discussions, performances and exhibitions. (18 - 19 August 2017) - Historical celebration. The Folk Rose Festival (July, 2019) - Folk groups from all over the world perform their music and dances. Trebon Cultural Summer (June-September 2019) - Concerts by various chamber ensembles in the Church of St.Mary Regina and St.Giles and in the chapel of Schwarzenberg Tomb. Around Trebon Music Festival (26 June - 1 July 2019) - Around Trebon Festival is one of the longest-running, multigenre festivals in the Czech Republic. It was first organized in 1992.The festival offers a variety of musical genres, unusual combinations of concerts and theatre performances, street happenings, competitive and fun races, and other entertainment. Krcin´s Trebon (July 2019) - Historical celebration. The Festival of the Five-petalled Rose (22-24 June 2019) - Historical Renaissancefestival with parades of people in medieval clothes as well as music concerts. The International Music Festival (19 July– 10 August 2019) - Largest of Cesky Krumlov´s festivals. It has been going since 1992 and includes music of all periods with the participation of renowned instrumentalists, singers, chamber ensembles, choirs and symphony orchestras. Celebrations of St.Wenceslas (27 - 29 September 2019) - Autumn fair, celebration of good food and drink, theatre pieces, and concerts for St.Wenceslas Day (Patron Saint of the Czech Lands). International Prague Spring Music Festival (12 May–4 June 2019) - International music festival featuring orchestral and theatre series, church concerts, recitals, morning concerts chamber music and symphony orchestras. Khamoro (26 May -1 June, 2019) - Roma Festival strives to show the richness and complexity of Roma culture and traditions. The festival is divided into 3 sections - professional, cultural and media. The festival strives on the one hand to present Roma culture, art and traditions as an integral part of Czech, European and world culture. Prague Autumn ( September - October 2019) - International music festival. winters. 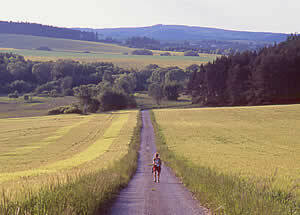 The best time for Czech Greenways cycling tour is between April and October. months to take advantage of the cooler, but still warm weather. areas with greater ease and with less people around.